A lot of planning went into our Open House information meeting and the planning clearly paid off. We had 21 invited guests, 1 walk-in guest, 6 Brookfield Rotary Club members, and one District representative join us Monday night for a lively and informative evening. The photo slide show ran while we socialized, a great dinner was quickly served, and the Power Point Presentation clearly explained who we are, what we do, and where we are going. The energy and enthusiastic vibes could be felt throughout the room. All guests were given a special gift and invited to attend a regular meeting. Follow-ups will be made. A very positive event. We are a Club on the move! Sturbridge Rotary is hosting a Dinner Dance to benefit the John Paul II Food Pantry in Southbridge. Join us on Friday, June 6 at Cohasse Country Club from 6:00 to 10:00 PM for a fun evening of dancing and socializing. We have a great buffet planned including chicken marsala and baked scrod with all the trimmings. Dance the evening away to music by DJ Sunshine Entertainment. Raffle tickets will be available and maybe you’ll be the lucky winner of the prize. Tickets to the event are $50 per person or buy a table of 8 for $350 and bring your friends. To purchase tickets, contact Austin Jenkins at 508-347-6512. Please bring a non-perishable food item with you to this event. See you there! Tweet Tweet – Time to Move in ! 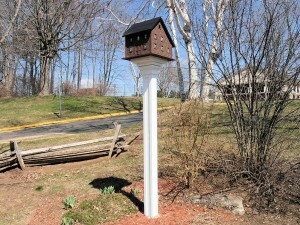 The bird house is totally repaired, stained, and put back up on its post in the Park. We went over an hour after the house was anchored and a little bird peeked out at us. She flew out and stayed on a branch close by while we quickly primed the platform that the house sits on. We went back the next day to paint the final coat and out she came again. This time she wasn’t happy. She tweeted at us impatiently until we finally finished. She must have been saying, “Enough is Enough”! No doubt she’s busy decorating and getting ready for her important task. Thanks to Mike Beaudry from Michael Beaudry Remodeling, she didn’t have to wait long because Mike did this job very quickly even though spring is one of his busiest times. If you see Mike, please be sure to thank him for donating his time and materials to do this project for us. Sturbridge Rotary and the birds thank Mike for his community service commitment. If you are in the area, stop by the Park and take a look, sit on the benches, relax and enjoy the view. The 8th Annual Day of Caring (through United Way of Southbridge, Sturbridge and Charlton) has been scheduled for Wednesday, September 24. 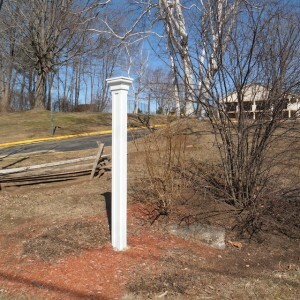 The Sturbridge Rotary Team members will participate in a Sturbridge community project. This year we will finish replacing the split rail fence on the north and west sides of Rotary Park. The photo shown here is the Route 20 side of the fence that we replaced last year in 91 degree heat. Let’s hope the temperature is cooler for us this year!! 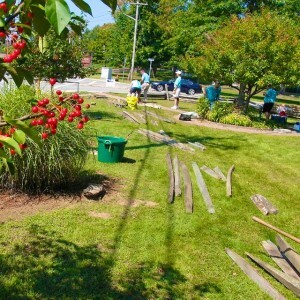 2013 – Removing the old rail fence. 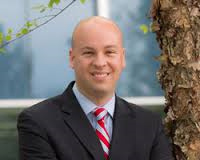 At the Club meeting on Monday, April 14, the guest speaker was Republican Mike Valanzola. 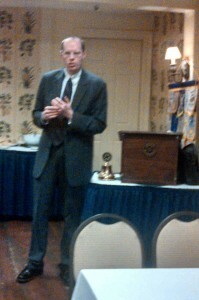 He is one of three candidates running for the office of State Senator and the second candidate to speak to Rotary. The District for this position covers 28 towns. Mike has been a selectman in the town of Wales and shared his accomplishments and his hopes for the future. The remaining candidate will speak to the Club members on May 12. While Rotary does not endorse any candidate running for office, we do want to be informed about the background, experience, and platform of each candidate running for a particular office. Tweet Tweet Hammer and Nails…and a whole lot more! The birdhouse is back from being repaired. In less than a week Mike Beaudry of Michael Beaudry Remodeling put on a new wide base and a beveled deck so the rain water will run off. Now that they have a nice deck, I hope the birds don’t ask for deck chairs next. 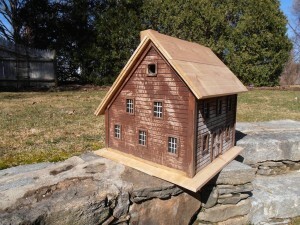 He also put on a new roof with a hinged clean out and new chimney’s. He did a fabulous job. And Mike has done all this at no cost to Rotary as part of his community service commitment. Next time you see Mike, please be sure to thank him. The bird house was a gift to Rotary when Rotary Park was built in 2007. It has a very colonial look which fits very well with the split rail fencing around the park. It reminds us of our neighbors at Old Sturbridge Village. We are currently busy staining the house and hope to have it ready to put back up later this week. The birds are patiently waiting to move in. Check back periodically for updates! Don’t be alarmed! We know the birdhouse is missing from the pole at Rotary Park. It seems the birds were complaining. Whenever it rained, they were getting wet sitting on their nests. So, we had to remove the entire house in order to put on a new roof. Like any home repair, once you get into it you discover others things that need fixing. Yes, it also needed a new platform. To make matters worse, the birds then asked for air conditioning. Mike Beaudry from Michael Beaudry Remodeling came to the rescue! Mike is repairing the birdhouse for us while busy with his business. If you see Mike, tell him the birds are anxious to move back in and redecorate! At the Club meeting on Monday, March 31, the guest speaker was Republican James Ehrhard who is one of three candidates running for the office of State Senator. He shared his background and ambitious goals with the Club members. The District for this position covers Worcester, Hampden, Hampshire and Middlesex counties which encompasses 28 towns. The two remaining candidates will speak to the Club members on April 14 and on May 12. Rotary does not endorse any candidate running for office, however, we do want to be informed about the background, experience, and platform of each candidate running for a particular office. A night of fellowship at the local Stageloft Theater was recently enjoyed by fifteen Club members and spouses. It was a fun evening with lots of laughter during the performance of “One Flew Over The Cuckoo’s Nest”.